A table saw is a requirement for ripping sheet wood, trim pieces, or any other sorts of accurate lengthwise cuts (rips) on lumber or mdf. The short of it is, we needed one. I looked around on the ‘net…even Craigslist for used ones and learned a lot. You can spend a LOT of money on a table saw. Well, you can if you have it to spend. I need a decent saw, but I’m not a professional woodworker. On the other hand, I know from experience that crappy tools make the work harder, and may not last through the job, making you spend more than you would have on a decent tool to begin with. A compromise is in order of course…here’s mine. 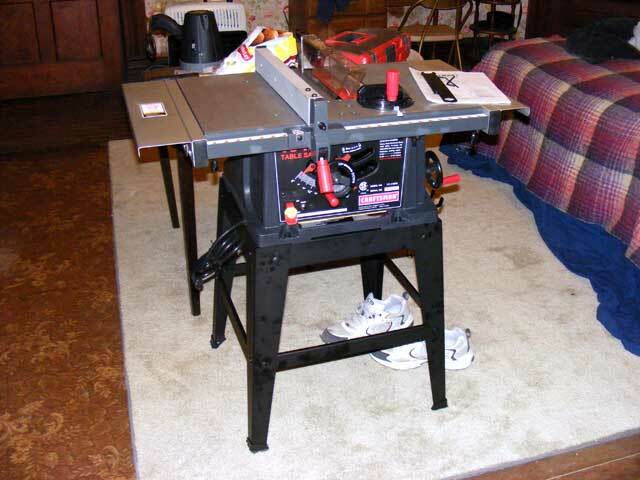 Craftsman (Sears) put this one on sale…a 10″ model (10″ refers to the blade size), with table width extensions and a stand. It has a metal table and rip fence and seems fairly accurate as far as angles and such. Used models of the same saw were selling for more on Craigslist than the new one was at Sears. Hopefully it will serve the extensive medium and occasional heavy duty use for this project, and then serve for the intermittent homeowner uses after we finish. We’ll see, and of course, we’ll let you know. $99 bucks. It seems to happen semi-regularly…watch for it if you need one. It’s in the bedroom, because as with nearly everything nowadays, it came from China crammed into the smallest box possible and needs “some assembly”. “Some Assembly” actually means it’s as far apart into it’s component pieces as possible, and everything that they put together for you was done wrong anyway. All the parts were there though…and it went together just fine. The base is kind of flimsy though. It came equipped with a decent combination carbide blade as well, instead (as I expected) a cheapo blade. It was also cold and dark outside and until we get some more wiring in, the bedroom (which is really the dining room) was the only place with sufficient light. Yeah…I got to play with a table saw in the bedroom. I think I kind of like this renovation stuff!